In 1981, Yamaha, the firm with the tuningfork logo, gave itself the daunting task of unseating Honda, the world's leading motorcycle manufacturer. Pushed on by its boss, Hisao Koike, Yamaha dedicated vast sums of money to this purpose. At that period, Honda had a far more diverse selection of bikes. 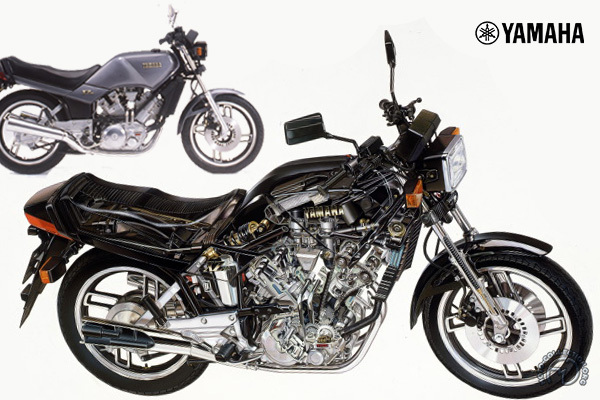 But, undeterred, Yamaha attacked its rival head-on, on every front, adding to and renewing its range. The XZ550 - an entirely new medium capacity Vtwin - was born out of this period of feverish activity. It appeared to be a real stormer, with its twin overhead-cam fourvalveheads and liquid cooling. However, its four-cylinder rivals - notably the very successful Kawasaki - still maintained their edge in that department. The XZ550 attempted to be aesthetically innovative, with angular lines and rear-set front hub, but only succeeded in alienating its customers. On the sales front, its shaft drive alienated sporting riders, while the tourists distrusted its sophisticated specifications. Worse still, it proved to be mechanically temperamental, and its carburetion problems were never resolved. Its reputation plummeted rapidly, and Yamaha tried to shift their remaining stock by the hasty addition of a fairing to create a new "S" version. The promising but fatally flawed XZ, the victim of Koike's vaulting ambition, became the symbol of Yamaha's lack of judgment during that time. Suspension: telescopic forks (front); cantilever (rear) . Tbe combination of original styling and high-tech specifications should have made the XZ550 one of the great bikes of the 1980s- but it was a dud.